An early test issue cover for the new Ontario Construction News daily newspaper launching on May 1. 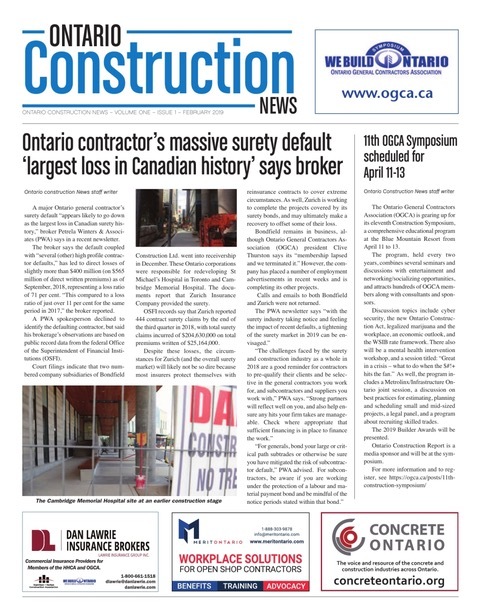 We’re about a month away from the scheduled May 1 launch of Ontario Construction News as a daily newspaper. A few years ago, I would have thought such a concept to be insane. And these days, with daily print media publications dropping like flies, you might on first impression wonder if in fact I have gone crazy in pursuing the concept. But there is some method behind the madness, and it is explained in regulations proclaimed last April, a few months before the Province of Ontario began reforming its construction lien and payments legislation in a new Ontario Construction Act, which went into effect last July 1. This law created something extremely rare in the business world, a legislated monopoly benefiting a private business. There is in fact a competing newspaper serving the market and it published daily, collecting hundreds of thousands of dollars a month with a few pages each day of CSP notice ads. I was well aware of this cometingpublication because every month, we would get a few calls from people wanting to place CSP ads in our publication. We were certainly publishing newspapers serving Ontario’s construction industry, but they weren’t daily, so we needed to refer the ads to the competition. And it would be folly to physically print a newspaper each day in competition — at best we would only collect a portion of the market from the entrenched competitor, and we would need to do that by charging significantly lower rates, messing up the break-even potential for any printed product. And the regulations contained a key phrase, which I’ve highlighted below, that changed the rules. (d) that is primarily devoted to the publication of matters of concern to the construction industry. We already had an alliance with a project reporting/tender publicizing organization, DataBid.com. Our graphic designer said he could handle the workload. And I could tell exactly how big the market is for the “certificate” ads because the competitor maintained a complete searchable database on these notices and, as noted above, EVERY project needed to have a notice ad. I analyzed break/even and market share and quickly realized this project made sense — though we would need to wait some time, because the new law included a transitional provision setting out that the old rules applied for projects that were either under-way or in advance planning stages before the law went into effect last July. In a practical sense, with a digital-only publication, we can achieve break-even with a small market share, even by discounting the competitor’s prices by 50 per cent. Originally I had planned to wait a year to launch the project, but decided to move it up to May 1, and so the next few weeks will be busy as we set up the systems to handle the publication. The website is almost ready, I’m contracting with a part-time editor to help with the work flow (he’ll go full-time as soon as we validate our revenues), and we’ll ease into the daily publication cycle by publishing weekly each Wednesday in April. The new business is a hybrid of new and old; working within specific local regulatory and legislative frameworks, specialized local industry knowledge, and an understanding of digital publishing and online marketing techniques. It’s exciting to engage in a start-up and I’m looking forward to the craziness in the weeks ahead as we prepare and then launch the new publication. Ingenuity in marketing: How do you do it?